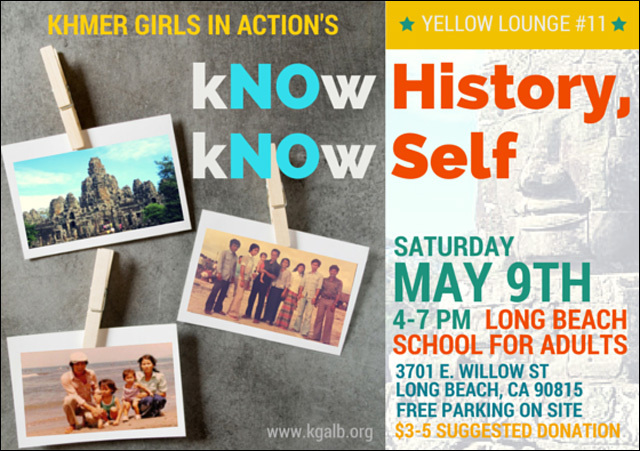 If you're in the Long Beach area, you're invited to Khmer Girls in Action's 11th Annual Yellow Lounge: "kNOw HISTORY, kNOw SELF," an arts and culture showcase celebrating the resiliency of the Southeast Asian community through art, music, spoken word,theater performances and traditional and modern dance. It's happening Saturday, May 9 at the Long Beach School for Adults auditorium. Through visual art, music, dance and theater, youth performers will share stories that celebrate Asian American Pacific Islander Heritage Month. This year also marks the 40th anniversary of the survival and resiliency of Southeast Asian people and culture. The event takes place at Long Beach School for Adults and we suggest a donation of $3- $5, although no one will be turned away for lack of funds. Free parking is available on site. Save the date and tell your family and friends to join us for a memorable community event! For more information about the event, visit Facebook and the Khmer Girls in Action website.